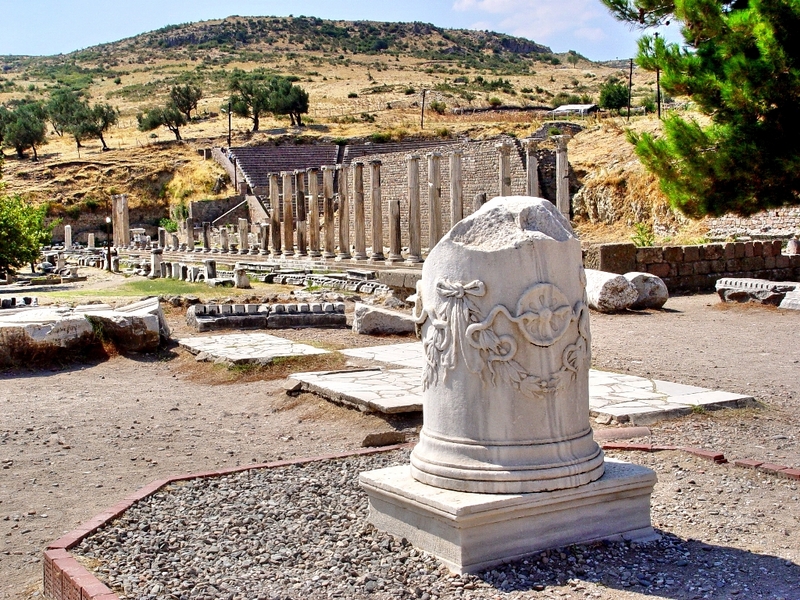 Pergamum was the principle seat of the worship of the god Asklepios, the Roman god of medicine and healing. An elaborate complex devoted to healing was constructed downhill from the upper city. 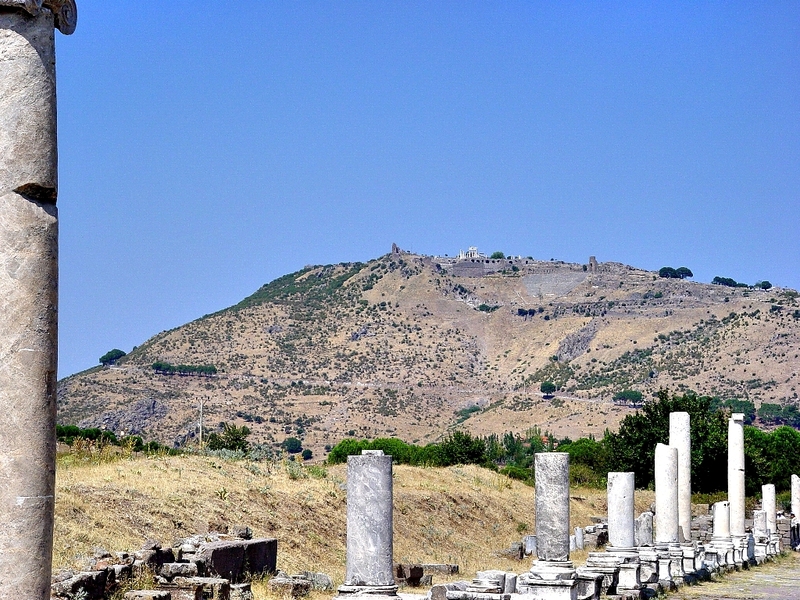 Our photo below was taken from the Asklepieion looking up to the acropolis of Pergamum. Asklepieion with view toward Pergamum acropolis. Photo by Leon Mauldin. Look at the center of the upper city. The white ruins are those of the temple of Trajan, featured in an earlier post. So many people came from so many places to the Asklepieion, that a library and theater were provided. Included in that number were Roman emperors Marcus Aurelius and Caracalla, both of whom traveled here to be healed. The photo below shows the site of the library and the theater. The theater would seat 3,500. Asklepieion Library and Theater. Photo by Leon Mauldin. In the foreground of our photo you see the the column features serpents, the symbol of Asklepios. 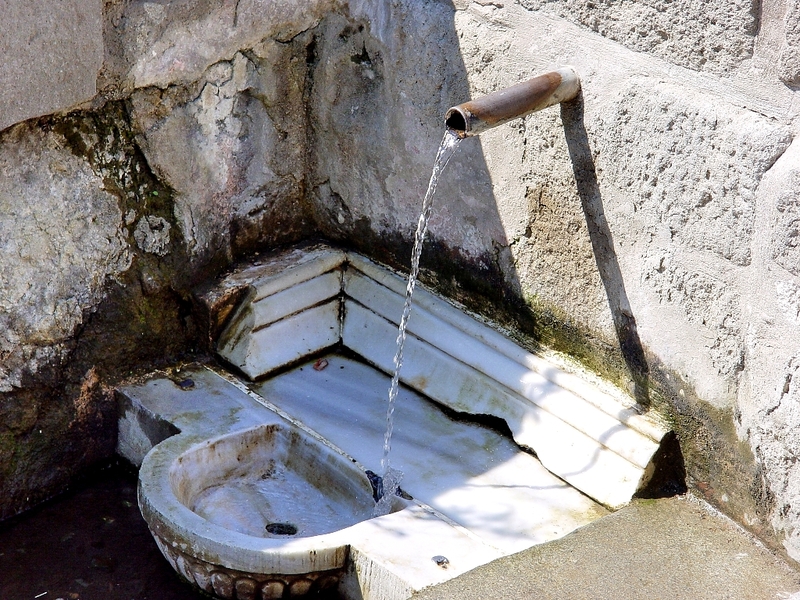 At the Asklepieion there were fountains and pools, where patients could bathe, as well as drink what was thought to be sacred water. Asklepieion Sacred Fountain. Photo by Leon Mauldin. Remember to click on photos for higher resolution. I plan to follow-up with another post on the Asklepieion, so stay tuned. On a personal note, I have just concluded a 6-day series of lessons on the History and Geography of the Bible with the church of Christ at Clayton, N.C. William Dickinson is the preacher here. It has been a good week. This entry was posted on Friday, May 21st, 2010 at 11:07 PM and is filed under Archaeology, Bible History and Geography, Bible Study. You can follow any responses to this entry through the RSS 2.0 feed. You can leave a response, or trackback from your own site.